Before doing any audio transfers, it is necessary to make sure that the Revoice Pro Session variables match those of the Nuendo/Cubase project. This is generally only done once per session (but the settings can also be saved as a default). Open Nuendo and the required project. Set Nuendo's Tranport Panel Tempo to "FIXED" and note the Bar/Beats value as shown below. In Nuendo's Project menu, open Project Setup and note the Frame Rate and Start time as shown below. Open Revoice Pro and in the View menu in macOS or the Window menu in Windows, select Settings to open the Project Settings window. The image on the right shows the settings dialogue box for Windows OS. The four fields listed below must be set to match the Nuendo/Cubase project settings. The picture on the right shows the settings for the example Nuendo project above. 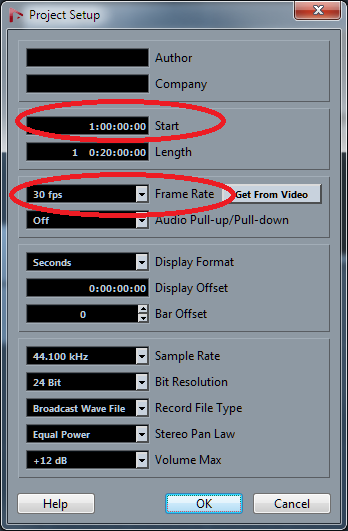 Set Timecode Rate to the Nuendo/Cubase project frame rate. 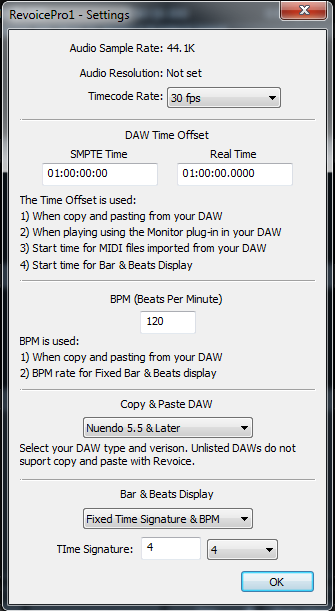 Set the DAW BPM value to Nuendo's/Cubase's Tempo value. Click OK when all settings have been made. If you wish to reuse these Project settings for futher Revoice Pro sessions, open the Revoice Pro File menu and select Save As Default Session.